The first thing I’m going to do here is stop making any kind of pledge to post here more often. Life just doesn’t work like that for me any more, and I think it’s time to stop apologising for that. For better or worse, Facebook seems to be an easier platform to keep updated, so most of what we’ve been up to is documented there, but in short, we played at Cheltenham Music Festival (a great show to very few people, sadly), got noise complaints for putting on a performance in a bandstand (Zoetrope), we performed at CRUX for a second time (always great fun, lovely crowd & organisers), played our first wedding, learned how to build and program our own lights, expanded our Bleephaus workshop programme to 2 festivals, created virtual sets for a theatre performance, had our first solo art installation, and designed a stage show for a new awesome band called BAAST. I suppose that’s quite a lot alongside 2 regular demanding day-jobs, now I reflect back on it. Another thing I’ve been occasionally involved in is a project called SPACES, with a long-time friend, colleague and musician called George Moorey. He recently took a step back from teaching to focus on his art, and curated a project based around composing 8 pieces of music in response to buildings in Gloucester and its rich heritage. I’ve been in awe of it – and not a little envious of how George has worked so generously with other artists to create not only beautiful music but also rich, valuable documentation of the process. The project has been a joy to be involved in, but the one thing that’s resonating with me most, the day after the launch event last night, is how the stories and the craft of a piece of work can be at least as important as the work itself, if not moreso. So that might be an early new years’ resolution for me – document the work, tell the story. But then I’m at the start of term, and the day job, as wonderful and exciting as it always is, is about to demand my full attention, so maybe I’ll refer back to my opening comments and just try my best to make more notes as we go. Lee Chaos and Adrian Giddings perform and create as temp0rary – a live A/V project that operates on the outer edges of the fields of improvised electronic music & visuals incorporating audience participation, theatre, circuit bending, multi-screen projections, hand-built synthesisers and hacked consumer goods. Previous temp0rary performances have taken place at diverse locations from Latitude and Boomtown music festivals, to restored underground nuclear bunkers and abandoned police stations. For this performance, temp0rary will be presenting a selection of pieces from their career that have been remodelled to demonstrate their fascination with audience participation and accesible technologies. Those in attendance will be able to not only watch the performance but interact and collaborate with the artists via a range of handmade, hacked and modified equipment, making music from touch, light, breath, movement and brain activity for a truly interactive experience. Support comes from upcoming downtempo ambient electronica act Diessa. 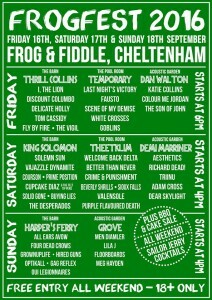 I have been asked to provide a day of fringe electronic music events as part of the Cheltenham Music Festival. Date TBC. temp0rary and other live electronic acts will be performing in The Zoetrope – a repurposed bandstand in Montpellier Gardens, Cheltenham featuring a custom built 360-degree AV installation. If you want to book us for your event, please get in touch. temp0rary are delighted to be performing at CRUX next Saturday 18th February. We will be doing a live talk / demonstration about the pros and cons of using networked computers for live performance, and performing an AV set alongside some other fascinating artists. We don’t play London often, so come and pay us a visit! So, it’s been a while… Apologies for the relative silence, it’s been a hectic couple of months, followed by a couple of weeks of self enforced downtime to recharge the batteries. Anyway, enough of this high drama – temp0rary are back in the labs working on a couple of exciting new projects and doing some development for forthcoming events. 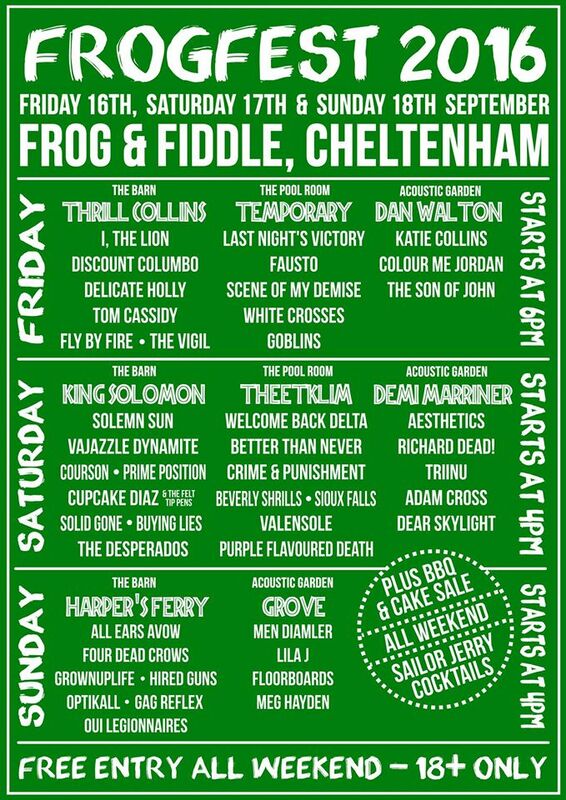 First up, and somewhat imminently, we are delighted to announce that we will be headlining the Pool Room stage at FrogFest 2017, which is at the Frog & Fiddle, Cheltenham. 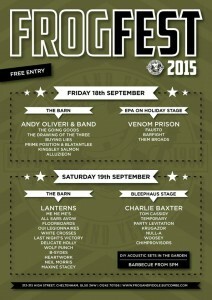 We play on Friday 16th September, but the event runs all weekend and is free. We’ll be doing our best to cram our biggest show into the smallest space, as usual. Then on Thursday 13th October, we are proud to announce that we will be collaborating with four local poets – JPDL, Anna Saunders, KA Poetry and Dan Cooper on ‘Augmented Poetry‘ at the Wilson Gallery, Cheltenham as part of the launch of the ‘Last Word In Art’ exhibition. For this performance we will be working with the poets and enhancing their live spoken word performances with surround sound and immersive visuals designed to bring the poetry to life in a unique and spectacular way. I’m also involved in setting up a new regular music get-together under the splendid title of MODJE – Music of digital, junk and electronics. We’ve got three get-togethers planned to find out who’s about and what people want, and then we will be up and running every week from 2017. Our first get-togethers will be on 26th October, 23rd November and 14th December from 6pm at the Wilson Gallery, Cheltenham, and are free. More details to follow, but the first sessions will be a social with a show & tell / run what you brung / jam session / meet & greet vibe. Free entry, with all ages welcome. 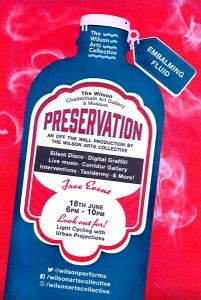 Oh, and then we’ve been asked to be involved in another Wilson Gallery takeover night on Saturday 12th November. No idea what we’re doing yet, but if it’s as good as the last one, you’re in for a real treat. So that’s us all up to date for the rest of the year, with a couple of collaborative bits and bobs taking shape int he shadows. Over the next couple of weeks I’ll be catching up on all the documentation for the work we did over the summer too, so if you missed out, I’ll be rounding up all of the media files and sorting them onto the website real soon. Hope to see you out and about soon. In addition there may be one or two temp0rary music installations around Cheltenham as part of the music festival… more info soon. Plus we’ve got plans for some more events before the year is out, and I’ve promised to myself I’ll bring this site up to date in August. So, it’s been another couple of months, and seemingly there hasn’t been a great deal going on in camp temp0rary. In reality, there’s been a significant amount of discussion, meetings and planning, the results of some of which can be shared now. The big news is that I recently decided to end my part-time teaching contract so that I could focus on other music projects. This has resulted in some excellent meeting of minds in Cheltenham and a couple of forthcoming events. 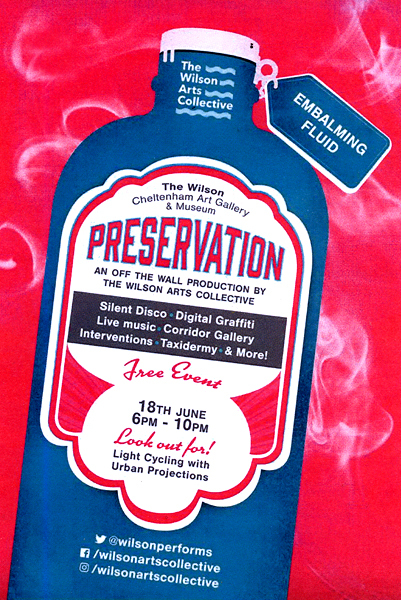 Firstly, temp0rary are delighted to announce that we will be performing a long-form performance as part of Wilson Art Gallery’s Takeover event on Saturday 18th June. Our performance is scheduled to be in the late afternoon / early evening and will be using the same silent disco headphone setup we used for our collaboration with Tempting Failure at Latitude Festival last year. It’s part of a free event and there’s loads of other interesting stuff scheduled as part of the day so come along and pay us a visit! Secondly, we’re getting involved with the fringe of Cheltenham Music Festival which takes place from 1st – 17th July in varying capacities. Firstly, I am currently doing some work modifying and augmenting a full gamelan orchestra, which I will be adding electronic elements to under the direction of some young people as part of Wilson Art Group. The performance will take place on Saturday 9th July and will feature some traditional gamelan followed by our mad experiments! 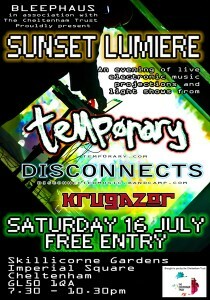 Then temp0rary play a site specific performance as part of an event called Sunset Lumiere – this will be a site-specific performance taking place at dusk in the secret Skillicorne Garden on Saturday 16th July with lights, projections and music, and again will be a free event. There’s more coming soon, including some exciting collaborations and music un unexpected places, we’ll keep you informed. temp0rary are slowly coming out of hibernation and warming up for the year ahead – there’s been a sudden outbreak of sketching new musical ideas, we’ve had a bit of a think about the lighting for live shows, bids have started to go in for new projects, and we are setting up some exciting collaborations for 2016. We hope to share some videos of work in progress in the coming months. So, it’s time to get back in the saddle, and our next temp0rary gig is this Saturday 19th September when we play on the Bleephaus stage for FrogFest at the Frog & Fiddle, Cheltenham, with other noisy electronic-based acts. For this performance, we’ve revisited the work we did at Craigiebarnes for Bunker Sessions II and turned it into a stand-alone performance which captures some of the sights, sounds and atmospheres of the lovingly-restored Cold War bunker. We’re sharing the stage with some other fine artists, so come along, bring a packed lunch and enjoy a day of unique music – for free! Only just hitting the deadline of one blog post a month this time round as I’m allowing real life to take priority during August as I get married with trusty temp0rary sidekick Adrian as my best man and regular temp0rary aide and assistant Ceri as my wife! July was a good and busy month for temp0rary – our visuals for the Promenade Players’ production of Chess were very well received by the audience, cast and reviewers alike, and it was fantastic to be one of the components in such a large production. We thoroughly enjoyed the experience and are actively looking for other opportunities to lend our skills to forthcoming theatre productions, so if you hear of anything, please let us know. Then we packed up our tents and camping stove and headed off to Latitude Festival to provide the soundtrack to day 2 of Silent Noise Dive, an afternoon of live performance art curated by Tempting Failure. We love working with these folks, as they provide us with some utterly unique opportunities and this one was no different. Working with 2 streams of audio, we broadcast our performance to silent disco headsets and composed music live using microphones and location sensors to enhance the performances in a 4-hour non-stop performance. It was a pretty intense experience, but we learned so much from being under these unique parameters and working with such a unique performance environment, as we always seem to when we collaborate on a Tempting Failure project. We’ll be collecting together all the evidence of both performances over the next couple of weeks if we have time and will do a fuller write-up showing some of the behind the scenes sketches and development of both performances. So that’s us done for the summer, but we are planning lots for the forthcoming months. 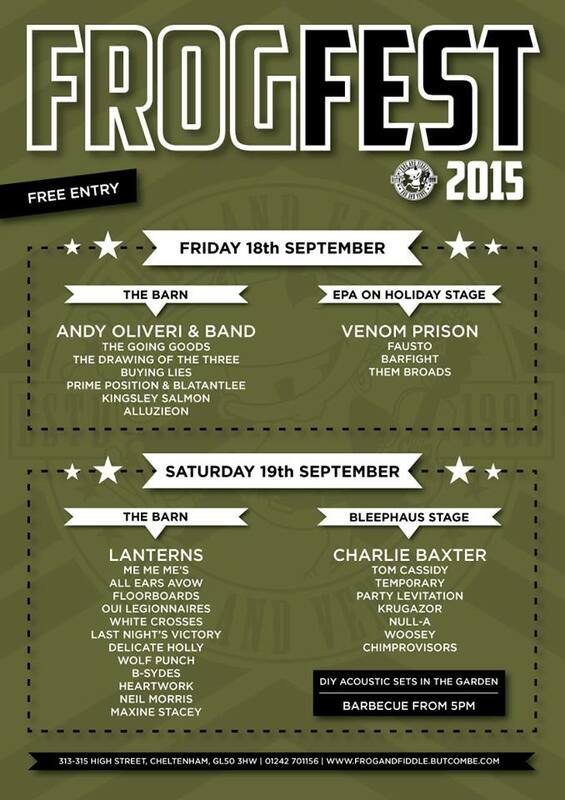 Next up will be the return of the Bleephaus stage at FrogFest on Saturday 19th September, at the Frog & Fiddle, Cheltenham. Again, I am delighted to have been asked to curate my own stage and am looking forward to putting on a selection of great electronic acts. Then we’ve got a selection of new works in the pipeline, including a project with bunker manager Gavin Saxby using some unexpected technology in a way it definitely wasn’t intended for..!